Last week, temps were in the 80s and I was keenly aware of how odd it was that I was simultaneously sweating in the heat and kicking fallen leaves around on the ground—those two things aren’t supposed to happen at the same time. Then, just as quickly as it got hot, the Sun snapped back into submission and we’ve settled into the crisp, blustery 60s that are supposed to mark this time of year. So of course, I want all the bread and butter. And cream and cake and hot chocolate and red wine and cheese and whatever else will make me feel warm and fuzzy inside. Who doesn’t love a good stuffed food product? Think about it: You can stuff mushrooms, turkeys, peppers…if it’s got a hollow space, odds are you can fill it with something tasty. Watermelons can overflow with fruit that is not entirely watermelon. Mushrooms snuggle close with cheese and breadcrumbs to make a delightful appetizer—out of fungus! Even soup looks better when you serve it in a hollowed-out, tiny loaf of bread. So let’s talk about all the Fall flavors I’ve managed to stuff into these personal-sized gourds. It’s a veritable Fall Feast. Many of my favorite Thanksgiving flavors—turkey, sage, apples, corn, rosemary—combined in a hearty, healthy, beautiful package. Bowls everywhere rejoice—you’ve got the night off! Preheat oven to 375 degrees. Cut the tops off the squash and dig out the innards, carving a small space. Turn the squash over and cut enough off of the bottom of the squash so that it stands up. Fill a high-sided cookie sheet with about 2″ of water. Place the squash on the sheet, top side down. Cover and bake for 25 minutes. When it is done, remove the squash from the oven and set aside. Reduce the heat to 350 degrees. While the squash is cooking, prepare the quinoa and corn: To cook the quinoa, combine the dry quinoa and water or chicken broth in a small pot. Bring to a boil, cover, and lower the heat to simmer for about 15 minutes. Check it periodically to make sure it has enough liquid. Remove from heat, fluff with a fork, and pour it into a large bowl. To cook the corn, boil it in water for about 6 minutes, remove, let cool, and cut the kernels off of the cob. Add the kernels to the quinoa. Remember to reserve some of the cooking liquid for the sauce. Heat the oil in a medium saucepan over medium-high heat. Sauté the ground turkey until it is cooked through. Use a slotted spoon to remove the turkey to a bowl. Keeping the drippings in the pan, add the ¾ cup of corn water, browning sauce, salt, pepper, two sprigs’ worth of rosemary, and two leaves’ worth of sage. Bring to a slight boil and add the arrowroot. Heat until thick, stirring constantly. Set aside. 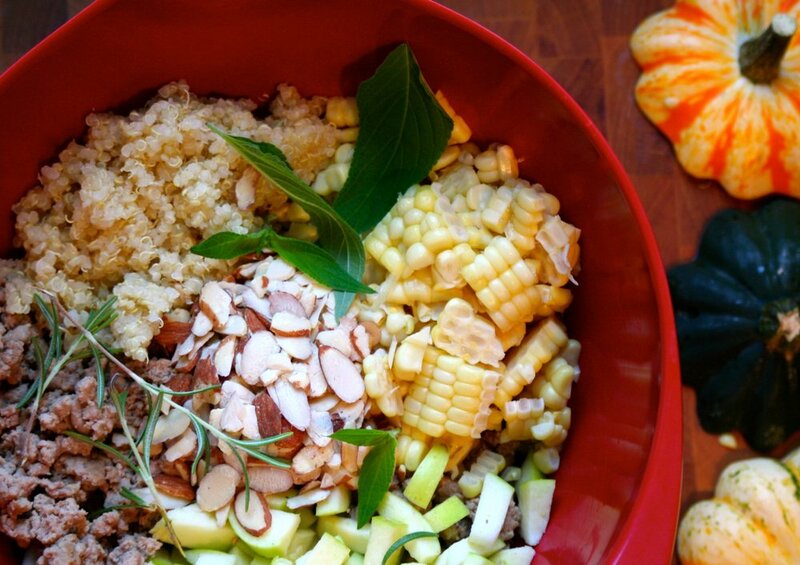 Add the apples, almonds, celery salt, celery seed, onion powder, and remaining rosemary and sage to the quinoa and corn. Mix well. Stuff the squash cavity until overflowing. Drizzle sauce on top of each squash. Place the stuffed squash back on the baking sheet (water poured out) and bake for 15 minutes. Garnish with fresh herbs.